When he was a child, the Brooklyn-based composer and guitarist Bryce Dessner went to a summer camp in the mountains of North Carolina not far from where Black Mountain College had been. This pathbreaking institution was founded in a 1933 as a college with arts at the core of its mission. Until it closed in 1957, faculty members like Josef Albers, John Cage, Willem de Kooning and Buckminster Fuller worked so collaboratively with students that it was hard to know who was learning from whom. Mr. Dessner, a member of the band the National, wanted to create a collaborative work that paid tribute not just to the college but to its ideals of intergenerational creativity and community. 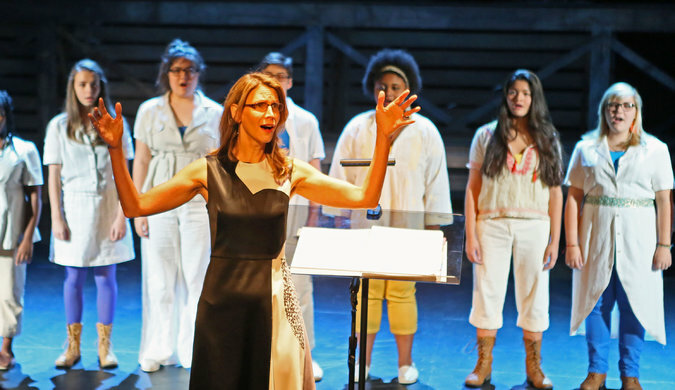 The result is “Black Mountain Songs,” an exhilarating 90-minute staged choral work with readings, videos, dancers and, at its core, the singing of the impressive Brooklyn Youth Chorus. The piece had its premiere at the Brooklyn Academy of Music’s Harvey Theater on Thursday night, the first of four performances. Developed over three years, the work was commissioned by BAM and the adventurous chorus, which has long been directed by the conductor Dianne Berkun-Menaker. Conceived as a narrative song cycle for chorus, the work has song settings by eight composers, Mr. Dessner among them. Most of the words come from poems and texts associated with Black Mountain. Other composers include Caroline Shaw, winner of last year’s Pulitzer Prize in Music for her choral work “Partita for Eight Voices”; Nico Muhly, whose “Two Boys” was presented last season at the Metropolitan Opera; and Richard Reed Parry of the art rock band Arcade Fire. Though the songs flow together and make an overall composition, they are written in varied styles: folkloric anthems; impressionistic ruminations with wistful, piercing cluster chords; stomp-and-shout romps; and more. The director Maureen Towey working with the set designer Mimi Lien, devised a simple staging concept. Eight instrumentalists, including Mr. Dessner on guitar and Ms. Shaw on viola, perform atop a rough-hewed wood platform, leaving ample space in front for the choristers to sing and move about. Above the performers is a video screen made of rectangular and trapezoidal shapes. Grant McDonald designed the videos and animated projections; there are also filmed segments by Matt Wolf, including scenes of Black Mountain luminaries at work: You see Fuller assembling one of his prototype geodesic domes using slats from venetian blinds. Sitting off to the side of the stage is the poet and artist Basil King, a Brooklyn resident since 1969, who attended the college. He shares his own recollections along with written ones by the author Fielding Dawson. As a theatrical work, “Black Mountain Songs” does better at evoking the spirit of the college than its history. It would have been helpful to identify more of those who appear in the videos. The choral songs at the heart of this work are performed with confidence, energy and tenderness (and from memory) by the 50 skilled singers of the Brooklyn Youth Chorus, who are mostly teenagers and mostly girls. Several songs require the singers to sustain ethereal, high harmonies spiked with dissonant intervals. The sheer beauty of their singing was captivating. Yet, in striving for beautiful sound, the chorus was often lax about projecting words clearly. Bringing attention to the words of the Black Mountain poets was a central goal of this work. Ms. Berkun-Menaker is a remarkable choral director. Still, there were times when I wished she had gotten the chorus to sacrifice a little aural richness for the sake of verbal clarity. For example, in “Black Mountain Song,” Mr. Dessner’s setting of a sort of tentative expression of love by Robert Creeley, the chorus excelled at sustaining the music’s intertwining melodic lines and pungent harmonies. But the words came through in a jumble, though Mr. Dessner did not make clarity a priority in the atmospheric way he composed the music. There were two songs by Ms. Shaw, both of which also had atmospheric elements. But she cared as well about making it possible for the words to be clearly understood. In her playful “Its Motion Keeps,” with words from a traditional hymn, the chorus sputters short phrases, building to the line “Time, like the tide, its motion keeps.” Some phrases are first sung in block chords or bits of patter, so the words come through. Only then does the song spin those words into vocal effects and intricate harmonies. The composer Aleksandra Vrebalov’s “Bubbles,” with a Creeley text, is a jittery, wordplay piece inspired by the work of Cy Twombly, in which animated images of curlicues are mimicked by spiraling riffs in the vocal parts. Mr. Muhly’s “Fielding Dawson in Franz Kline’s Studio” (with a Dawson text) was another highlight, a song enlivened by asymmetrical choral phrases and restless instrumental rhythms. Some members of the Brooklyn Youth Chorus have passed through significant chunks of their adolescence while this project was in development. It was heartening to see them basking in the standing ovation that “Black Mountain Songs” won from the audience that filled the theater.